Ten-men Rainworth’s interest in the Notts FA Senior Cup this season lasted all of 120 minutes against a combative Kimberley Miners Welfare side as they went down 3-1 in extra-time last night. Rainworth, of the EvoStik NPL Division One South can argue that for half of that time they played with 10 men and that they were missing key players through injury and unavailability. 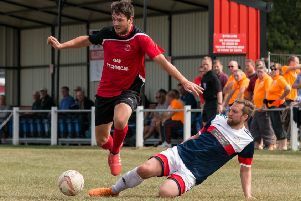 In truth East Midlands Counties League side Kimberley wanted it more than them and too many players let themselves down on the night. As for playing with 10 men, the Wrens have nobody to blame but themselves, as the last thing you do when you have a yellow card is commit a second offence straight in front of the referee. Kimberley showed their intent from the kick-off when after two minutes Anthony Gregory hit his shot wide as the Rainworth defence failed to close him down. Rainworth threatened in the fourth minute when debutant Kuwesi Ofushine found Sam Loughran, but his shot was blocked and Theo Brown’s follow went well over the bar. Ofushine was one of Rainworth’s only bright spots in the match and was impressive throughout, deservedly winning the man of the match award. Kimberley settled quickly into their rhythm and in the 26th minute Josh Stevenson shot from outside the box, but it was well wide. Three minutes later Alex Houghton was shown a yellow card for what appeared a trivial offence, but it was to prove costly later in the game. Kimberley’s Jermaine Gordon almost got on the end of a through ball in the 36th minute, but Jake Turner beat him to it and the chance was lost. The 41st minute saw Ofushine’s shot from outside the area just go the wrong side of the post with the keeper beaten. The final play of the half saw Theo Brown’s under-hit backpass intercepted by Gordon, but he put his effort wide when it seemed easier to score. Kimberley continued where they left off at the start of the second half and Stevenson’s free kick just cleared the bar. A rare flowing move by Rainworth ended with Craig Mitchell’s cross being deflected into the arms of Andrew Dell. Rainworth made their first substitution in the 59th minute, bringing on Alex Kenlock for Loughran. Then Rainworth shot themselves in the foot. An inviting cross just needed a touch, but as Houghton struggled to reach it he dived full length and attempted to punch it into the net. The incident was straight in front of the referee who had no choice but to award a second yellow and leave Rainworth with 10 men. This seemed to inspire Rainworth and for the first time in the match they managed to put Kimberley under sustained pressure. In the 70th minute Mark Camm came on for Oliver Brock and a minute later Dean Freeman’s goalbound shot was cleared. Then it was Mitchell’s turn and from a cross his backheader just cleared the bar with the keeper well beaten. Kimberley almost took the lead in the 81st minute after a mix-up in the Rainworth defence, but just as it seemed they would score they somehow failed to hit the target and it was cleared for a corner. As Rainworth argued it was offside, the corner was quickly taken, Rainworth half-cleared but the ball fell at Gordon’s feet and he placed it in the far corner to open the scoring. Rainworth brought Aaron Richards on for Hannigan and immediately got back in the game with an 85th minute equaliser. From a corner the ball was deflected into Mitchell’s path and he coolly clipped it into the far corner. Both sides had chances but there was no further score and the game went into extra-time. The first period of extra-time was a tense affair with neither side able to dominate, but in the final minute Mitchell fouled Jordan Whitehead in the area and Gregory stepped up to score and put Kimberley back in front. The second period of extra time saw Kimberley controlling the game against the 10 men, and it came as no surprise that from a flowing move in the 110th minute they extended their lead. A quick break and cross down the left found Elliott King, and he applied the finish. In the final minute of extra-time they almost scored a fourth as Gordon turned and hit a screamer just over the crossbar. Rainworth’s cup campaign this season has now ended at the first hurdle in all three competitions, leaving them to concentrate on their relegation battle. The management have some serious decisions to make for Saturday’s game in a team that is lacking firepower. As for Kimberley, on the night they were the better team and thoroughly deserved to progress to the next round. RAINWORTH: Turner; Asher; Freeman; Hannigan (Richards); Brock (Camm); Ofushine; Nwadike; Loughran (Kenlock); Houghton; Mitchell: Subs not used: Robinson; White. WRENS MAN OF THE MATCH: Kuwesi Ofushine.